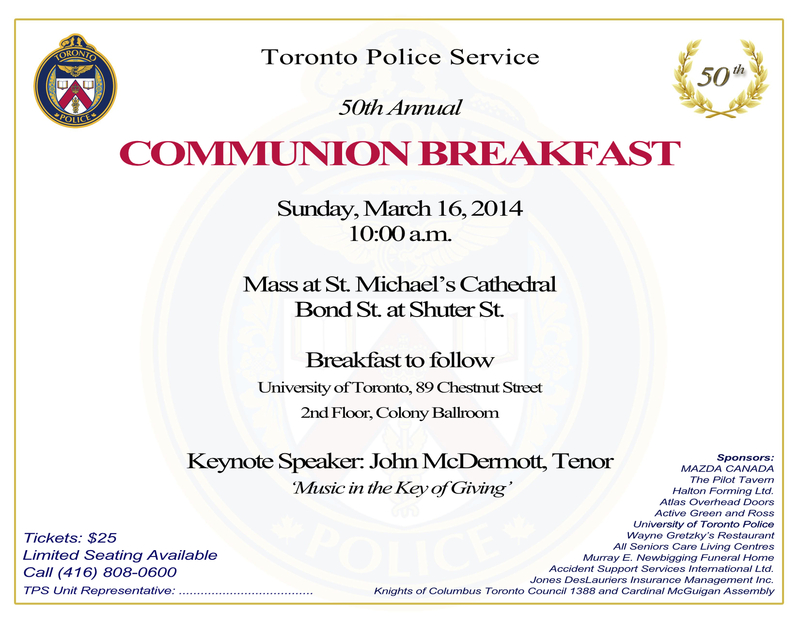 On Sunday March 16, 2014, The Toronto Police Service will commemorate its 50th annual Communion Breakfast. I'm fairly certain when a few Toronto police officers got together, in the winter of 1964, and decided to take their sons to Mass at St.
Michael's Cathedral followed by breakfast at a local restaurant, they never envisioned this event evolving into what it is 50 years later. For many years now, over 250 federal, provincial and municipal law enforcement personnel, members of the judiciary and other associated professionals join Toronto Police Service employees, both sworn and civilian, and their friends and families in this celebration of faith. It is truly a community and family affair. This year's event begins at 10 AM with Mass at St. Michael's Cathedral, celebrated by His Eminence, Thomas Cardinal Collins, Archbishop of Toronto, followed by breakfast at the University of Toronto Chestnut Residence. Centre. To date, pledges exceed $1,000,000. Your generous support in past years has been a significant reason for the success of the Communion Breakfast; it ensures this tradition continues to be an affordable family event. For this reason I am asking if you are in a position, once again, to offer your support in 2014. Each table is $250.00. Your patronage will be promoted on the tickets and acknowledged by the master of ceremonies at the breakfast. Also, we would be very pleased if you would consider attending this year's Communion Breakfast. Please contact Paul Shoniker for details. Happy New Year to you and your family and thank you for your continuing support.